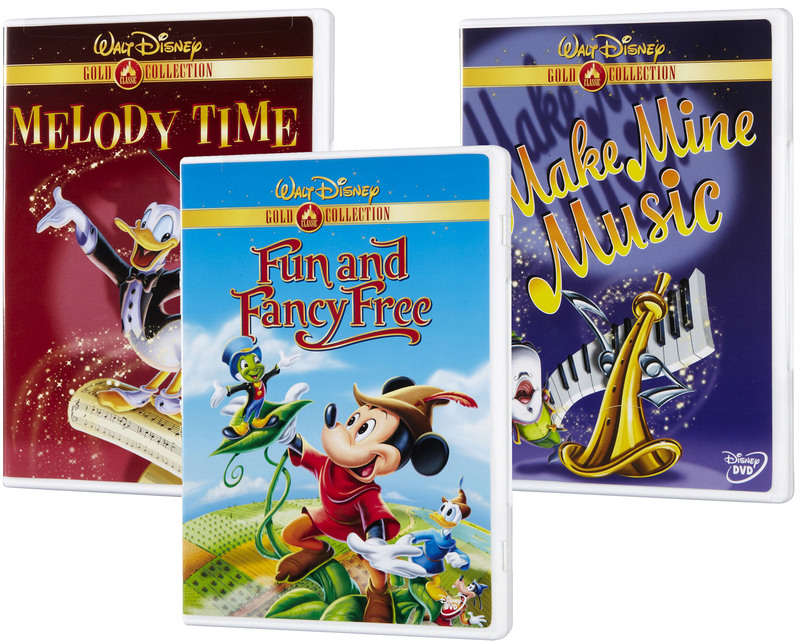 There are so many Disney Feature Films and we are planning on including the Pixar films as well for our trip countdown. 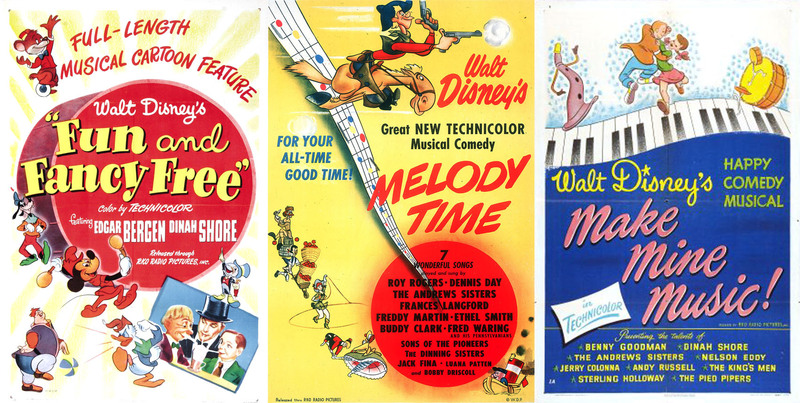 We only have a year until the trip so for this movie night we did all three of Disney’s early shorts: Melody Time, Make Mine Music, and Fun and Fancy free. I’m thrilled to say that my sister and her family are joining us on our trip to Disney. She is my best friend and I love her kids to bits! So for this movie night we celebrated at her place and we made a Casey at the Bat hot dog stand. 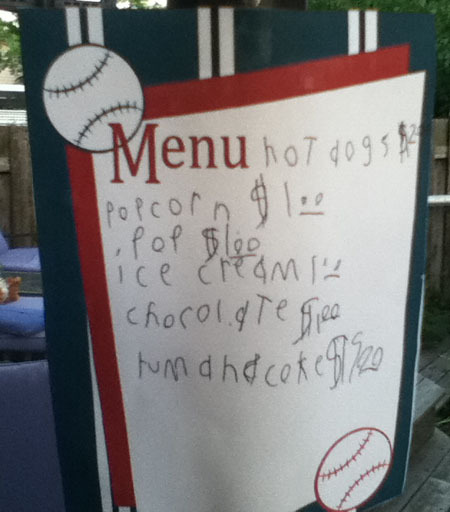 My son drew up the menu and as you can see, we had fudgsicles, hot dogs, caramel corn, pop, chocolate bars and rum & cokes (for daddies!). My daughter and niece painted an awning with acrylic paint on craft paper and ran to change into appropriate clothing to operate the stand. They also found a toy cash register and I gave everyone $7 in chocolate loonies and toonies to buy dinner with. There are no recipes for this night because except for the hot dogs, everything pretty much came straight out of the bag from the grocer and onto the table. My brother-in-law printed off the printables for the menu and the popcorn bag from online and I can’t find the originals but here are two links for the bag and the menu (just remove the text in the box ) that you can use instead. There were also two crafts because of it being a triple feature. 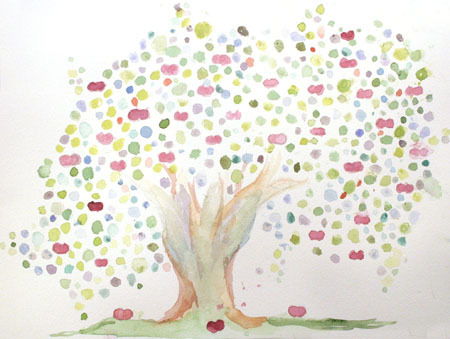 My daughter did a Johnny Appleseed painting and I found the inspiration for it on pintrest but the person who originally posted it there did not credit the artist. It took a lot of hunting but I finally found it here on etsy.com. Man that bugs me! If you are going to link to an artist’s work, at least reference it! I originally thought my daughter could do it with finger dots but water colour turned out to be much easier. All you will need are water colour paper, water colour paints, and brushes. My son painted a flower pot (Star Wars themed like his bedroom) and we planted magic beans in it that will apparently soon carry him off to the giant’s house a la Mickey and the Beanstalk. The idea and design for the flower pot came out of my head. All you will need are a pot, acrylic paints, brushes, some soil, and bean seeds. Another easy time at the dollar store! 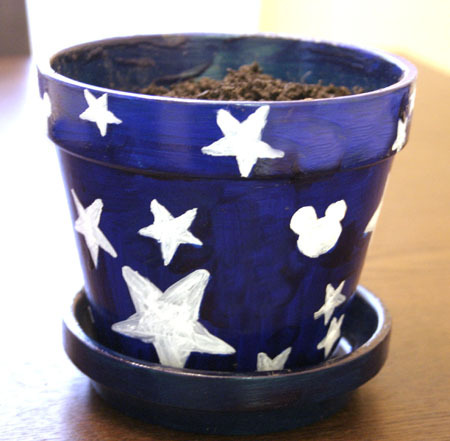 Help little ones paint a pot, add soil, seeds and voila – magic beans!